Power supply is continuously adjustable with rotary variable knob. Output voltage is monitored with Digital meter provided on the panel. Output voltage continuously variable from 0-5kV at a maximum current of 2 mA. Fuse protection for the primary windings. External earth socket for additional safety. Safety Sockets for the output voltage suitable for safety plugs. 6.3 V AC, 2 Amp. is provided for the filament supply. D.C. Voltage Continuously variable from 0 to 5 kV. Used with the experiments of Kerr Effect. 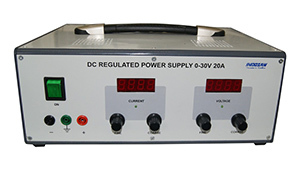 This is an adjustable voltage and current regulated DC Power Supply. It provides low ripple and a high precision, continuously adjustable voltage and current .When it is in the status of regulated current, the current regulation is continuously adjustable in the rated range. Used with the experiments of permitivity in air apparatus (SV244), Biot Savart's Law. Suitable for all general purpose applications, laboratory use, experimental setups, circuit development, component/circuit evaluation, industrial applications. Good performance at low cost. Continuously variable output 0 - 16 V DC. Big clearly readable bright LED Display of the output voltage 0 -16 V DC. Coarse & fine controls for 0 -16 V DC. Fuse protection for the primary winding. Automatic crossover type protection against overload & short circuit for 0 -16 V DC. Used with the experiments of Basic Electronics kit (SK094/SK095 / SK096, SA031). 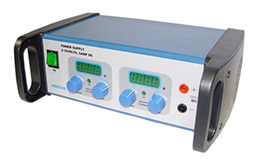 Voltage 0-16V, 5Amp DC continuously variable & stablized. Current Continuously variable from 10% to full rating. Display Two separate displays(3 digit LED) are provided to monitor the output Voltage and load current continuously. Used with the experiments of Magnetic field along the axis(SED1001), Magnetic field in Helmholtz Coil (SED1002). Digital Gauss Meter with Axial hall probe to measure the magnetic field along the axis. An adjustment knob ,provided to set the magnetic field ZERO. Used with the experiments of Magnetic field along the axis (SED1001), Magnetic field in Helmholtz Coil (SED1002). 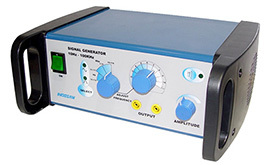 A low distortion signal generator with four decade ranges selectable by rotary switch. Sine waveform and square waveform selectable by membrane switch with LED indicator. A built in speaker is provided for audible frequencies and is selectable by membrane switch. Range 10Hz to 110 KHz in four decade ranges. Output Continuously variable from 0-7V p-p, 5W. Working Voltage 230V AC, 50Hz. Used with the experiments of Wave demonstration kit (SA009).